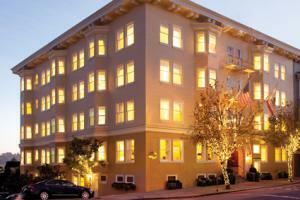 Luxury hotels in San Francisco are plentiful and sumptuous. If you want to live high on the hog during your next trip to the City by the Bay, you have some ideal choices. Goodbye motel life, hello five-star luxury accommodations. There are plenty of great options to consider. With 336 luxurious guest rooms that come with breathtaking views, the Ritz-Carlton is a destination in itself. This downtown hotel includes a fitness center and a full-service spa, plus the prestigious Parallel 37 restaurant, featuring local ingredients whipped up under the direction of Chef Michael Rotondo. The hotel and its amenities reflect the vast cultural diversity of San Francisco, from its restaurant's menu to featured local art adorning the walls. 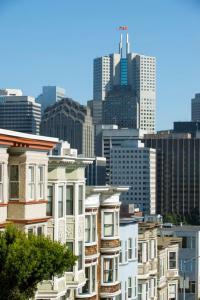 The location is close to Chinatown, Union Square, and a short walk to Nob Hill. This easily recognized, 12-floor luxury hotel is found within a high-rise residential building just minutes away from some of San Francisco's greatest cultural and shopping attractions, including the Museum of Modern Art, Union Square and the Yerba Buena Gardens Center for the Arts. 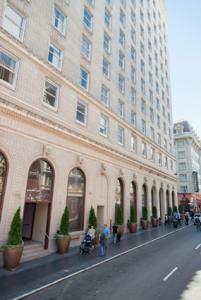 The rooms are among some of the largest of all San Francisco hotels, and the suites are even bigger. For those of you traveling with children, rejoice; you'll find babysitting services on the premises. 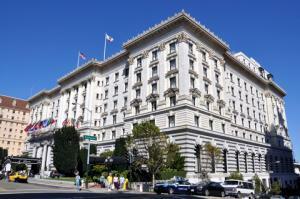 The Fairmont San Francisco is, without a doubt, one of the most beautiful buildings in the entire city. Perched atop posh Nob Hill, this fully-restored hotel has been one of San Francisco's top-notch destinations for years. 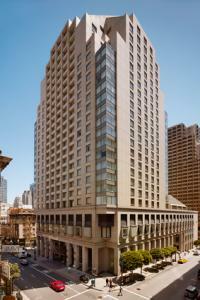 There are 591 guest rooms, each with spectacular views of the city and the San Francisco Bay. 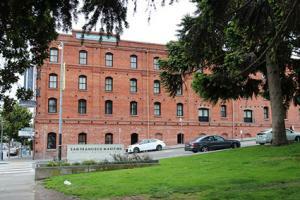 The location provides easy access to Union Square shopping, Chinatown, and Fisherman's Wharf. You will not want to miss a visit to the hotel's famous tiki bar, the Tonga Room, where it periodically rains from the ceiling. Since 1924, this hotel (formerly The Huntington Hotel) has beckoned guests to the top of Nob Hill and treated them with gracious hospitality that starts with a well-appointed doorman. Named after one of the early railroad barons, C.P. Huntington, the hotel is known for offering a tranquil and luxurious stay for its guests. None of its 136 guest rooms are alike, but each comes with plush bedding, upholstered furniture, and sweeping views of the city. Hop on the California Street cable car for a quick trip downtown past Chinatown and into the Financial District, or head uptown to Polk Street for some off-the-beaten-path dining and entertainment. Polished and ultra-modern, yet classic, Clift features 374 guest rooms, all of which offer fantastic views. Located just off of Union Square, the hotel is convenient to the theater district, upscale shopping, Chinatown and the Financial District. Definitely stop into the famous and remodeled Redwood Room for a drink. This modern Japanese skyscraper features 533 streamlined rooms, mixing a boutique feel with a bend toward business-minded guests. Hotel Nikko enjoys an ideal location just a block away from the cable car stop near Union Square at Powell and Market Streets. The distinguished AAA Four Diamond Award winner offers upscale amenities such as high thread-count linens and oversized bathrooms outfitted in marble and granite. Top-level Imperial Club rooms include breakfast daily plus a hosted evening wine and beer reception. Access to the 10,000-square-foot health club, including the large indoor pool in the fifth floor solarium, costs extra (but is free for Imperial Club guests). There's a full-service Starbucks and UPS Store Business Center on site as well. The hotel website highlights the property's LGBT-friendly status. 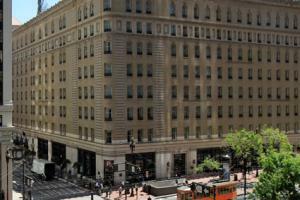 The Westin St. Francis is the crown jewel among the many hotels that stand close to San Francisco's popular Union Square. Built in 1904 as a property to make San Francisco the "Paris of the West," the St. Francis is beloved for its service and attention to detail. The signature Heavenly beds will have you talking with friends about your night's sleep for months to come. 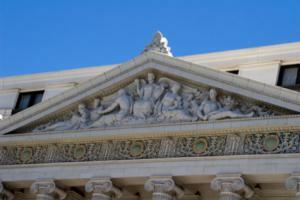 The hotel is across the street from Union Square and surrounded by upscale shopping, dining, and theater venues. This locally owned and operated hotel sits among the mansions of Pacific Heights, where you will find exquisite shopping and dining as well as extraordinary views of the San Francisco Bay. Upon arrival, you'll be greeted with fresh fruit and an offer to join the evening wine reception that features local artisan cheeses and other hors d'oeuvres. A nightly turndown service comes with chocolate shortbread cookies and ice, plus pillow selection from a pillow menu. The hotel provides free wireless Internet access throughout, 24-hour room service, and weekday morning chauffeur service. 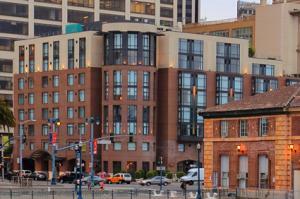 If you are looking to stay near Fisherman's Wharf, this is the luxury hotel for you. The decor is inspired by the maritime history of the area, and the building is more than 100 years old. The hotel features in-room spa service and a nightly wine reception hosted by its master sommelier. Its 252 rooms include complimentary wireless Internet. Nearby, you'll find Ghirardelli Square, access to the cable cars, and the sights at Fisherman's Wharf. Deep in the Financial District, the Mandarin Oriental provides luxury accommodations where each of its 151 rooms and seven suites offers a fantastic view of the city or Bay, and every bathroom is decked out in Italian marble. 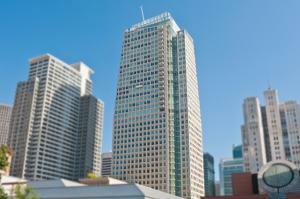 The location is near the city's top attractions, including the Embarcadero, North Beach, Chinatown, and Union Square. This upscale yet child-friendly hotel offers an array of children's activities, a children's menu, and babysitting service. 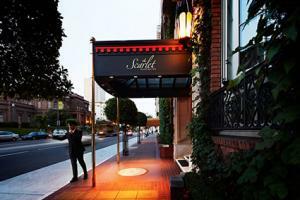 In the bustling South of Market (SoMa) district, Hotel Vitale is a luxury boutique hotel that offers an urban retreat with plenty of amenities. Each of its 200 guest rooms offers complimentary wireless Internet, as well as an iPod/MP3 docking station. The bathrooms are covered in limestone, and guests will enjoy bathrobes, slippers, and their choice of pillow from the hotel's pillow library. The hotel's Spa Vitale features private soaking tubs on the rooftop deck. The hotel also offers complimentary car service. In SoMa, you will be close to the Moscone Center, the San Francisco Museum of Modern Art, and Yerba Buena Gardens, as well as fantastic dining, bars, and clubs. No listing of this city's luxe hotels would be complete without a mention of The St. Regis. 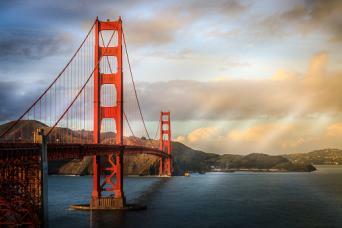 The modern 260-room San Francisco property is on every best-of list out there, including the well-regarded Conde Nast Traveler Gold List 2014. Naturally, the stylish rooms, atmosphere and service are routinely top-notch. High-end amenities abound, like the luxury linens, showpiece soaking tubs, flat-screen TVs, and turn-down attention you'd expect. But who else can boast 24-hour butler service? Or "five-foot-long fainting sofas"? 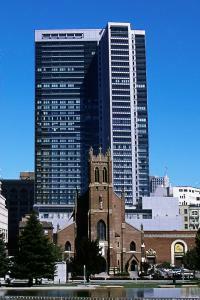 The Museum of the African Diaspora calls The St. Regis home; the 20,000-square foot museum is housed on the hotel's ground floor, and the San Francisco Museum of Modern Art is located directly next door. Luxurious, certainly, but the words "elegant" and "gracious" also leap out when describing this famous 552-room landmark, akin to a European castle. It definitely lives up to its name. Originally built in 1875 - then the largest hotel in the world - the iconic Palace Hotel remains very much a historic tribute to royalty. Its breathtaking, domed Garden Court restaurant hosts daily breakfast, lunch and afternoon tea (on the weekends, along with Sunday brunch) beneath stained glass and Austrian crystal chandeliers. The guest rooms, replete with 14-foot high ceilings, honor its old-world charm, but they have been brought up to date with modern touches. There is an indoor, sky-lit, heated pool on the fourth floor with a sauna and whirlpool, and also a 24-hour fitness center. 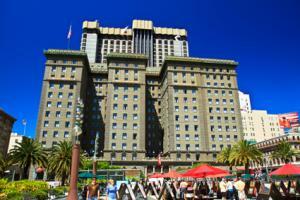 Like any major metropolitan city, San Francisco has plenty of luxury hotels. While that luxury comes with an expensive room rate, many of the hotels offer packages and deals that decrease the price. Be sure to also check travel discount sites, such as Expedia and Orbitz to find the best rates on these amazing hotels.